Grant Park is no stranger to hosting fitness events. If you live in the Windy City, how many times have you passed the park on a weekend only to see it scattered with event tents, and not the kind that signal a music festival or Taste of Chicago? Probably a lot, especially this time of year. 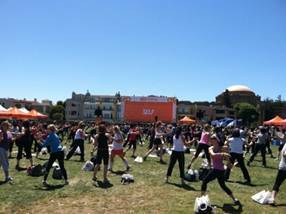 And typically right around this weekend, Grant Park would be ready to play host to an old favorite, SELF Magazine's Workout in the Park, which was held at Butler Field last year on May 21. One problem: NATO is coming to town and the Workout in the Park won't be in May but in June. I can't blame NATO entirely, even though it is the obvious choice given that businesses in and around the Loop are shutting down Friday through Monday and many workers have been granted a three- or four-day weekend. If the NATO conference wasn't about to take over Chicago, literally, I'd assume that SELF's mobile exercise-y event would most likely stick with the weekend that has worked and not be pushed to later date (especially considering that San Francisco kicked off this year's festivities on May 5 followed by New York City on May 12). But it happened and there's nothing we can do about it except hope that a June 2 date means a greater assurance of warmer, workout-friendly weather. It's a four-hour workout. The Workout in the Park runs from 11 a.m. to 3 p.m. on Saturday, June 2. You don't have to stay for the full four hours nor do you have to exercise the entire time, but the option exists for those who want to sweat off their Friday night or prep for their Saturday night. And it's tough for this fit gal to want to pass up one of the workouts knowing that the day includes a sampling of the POUND Rockout Workout, Hippie Yoga, Fly Girls. I might trip over my own two feet in the latter, described as easy-to-follow dance routines, but my body could use the hip openers and I've been watching POUND online for months. It's being hosted by Dolvett Quince--you know him as the Red Team trainer on The Biggest Loser. Seeing Dolvett and hearing what he has to say about healthy, active living might be reason enough to buy a ticket. It's a double dose of fitness. Not only do you get to partake in all the happenings at Butler Field like trying the hottest new exercise trends from CRUNCH, nutrition know-how, beauty demos, freebies, giveaways, and more, but you also get to enjoy these same things for the next 12 months with the one-year subscription to SELF that's included with the ticket. It's for a great cause. Doesn't it feel good to get your sweat on when you know that the proceeds are helping someone or something that really needs it? Of course! And SELF will make a donation to two participating charities, Cancer and Careers and The Conservation Fund. Sound like fun? Sure it does! Buy your ticket before their gone, and learn more about the event that's celebrating its 19th year, by visiting www.selfworkoutinthepark.com.